Winner of the Under 21 Women’s Singles title the previous day, China’s Wang Yidi alongside colleague, Liu Xi caused the upsets as play concluded in the opening round of the Women’s Singles event at the Seamaster 2018 ITTF World Tour Asarel Bulgaria Open in Panagyurishte on Thursday 16th August. Both caused Japan heartaches; arguably Wang Yidi caused the bigger migraine by beating Mima Ito, the no.2 seed (11-2, 7-11, 11-3, 13-15, 11-6, 11-3) but the win recorded by Liu Xi was equally to be respected, she accounted for Hina Hayata, the no.5 seed (11-6, 11-7, 9-11, 11-4, 11-3). 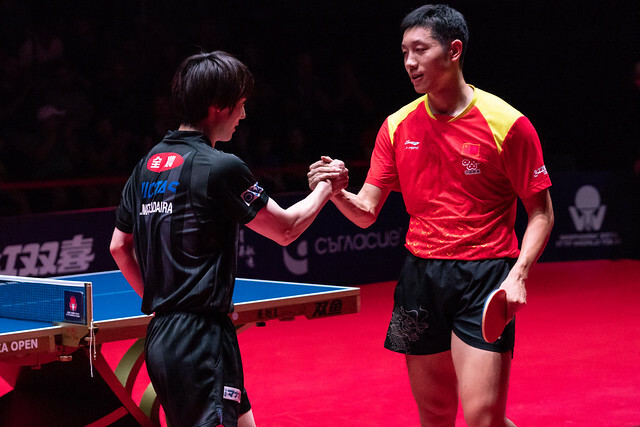 A shock win for Wang Yidi, I would suggest not; earlier this year this year in March, she faced Mima Ito in the opening round of the Women’s Singles event at the Seamaster 2018 ITTF World Tour Qatar Open in Doha. On that occasion Wang Yidi won in seven games (11-7, 4-11, 8-11, 11-7, 11-4, 9-11, 11-4). Problems for Mima Ito and Miu Hirano but not for their colleagues Hitomi Sato, Honoka Hashimoto and Saki Shibata, all stood firm against players who had impressed in the two days of qualification. The defensive skills of Hitomi Sato, the no.4 seed and Honoka Hashimoto, the no.10 seed, proved safe and secure. Hitomi Sato beat Korea Republic’s Park Joohyun (6-11, 12-10, 11-8, 10-12, 11-5, 11-8); Honoka Hashimoto emulated her colleague, she accounted for Poland’s Natalia Partyka (11-9, 11-7, 11-7, 11-5). Somewhat conversely, utilising her ever more consistent attacking skills to good effect, Saki Shibata, the no.8 seed, ended the hopes of Luxembourg’s Sarah de Nutte (11-6, 11-5, 11-5, 11-7). Notable performances from two Japanese defenders, it was the same from a player of the same style in German colours; Han Ying, the no.14 seed, accounted for Chinese Taipei’s Lin Chia-Hsuan (11-7, 11-3, 11-4, 8-11, 11-9). A most efficient performance from Han Ying, in a different manner, similar to that of Saki Shibata, Puerto Rico’s Adriana Diaz, the no.15 seed, imposed her authority on proceedings. She ended the hopes of Romania’s Irina Ciobanu (8-11, 16-14, 11-6, 11-4, 11-7). Worthy wins but perhaps the success that went somewhat unheralded was that of Hungary’s Georgina Pota, the no.13 seed. She accounted for Korea Republic’s Kim Hayeong, the player the previous day who had beaten Japan’s Miyu Nagasaki, the highest rated player in the qualification tournament to reserve her place in the main draw. Maintaining focus, Georgina Pota withstood a spirited recovery to emerge successful by the very narrowest of margins in a full distance seven games duel (11-7, 11-8, 11-8, 2-11, 8-11, 4-11, 11-9). The second round of the Women’s Singles event will be played on Friday 17th August.